Bishop Michael Olson celebrated Mass at St. John Parish in Strawn on December 1, 2018, the first Sunday in Advent, with parochial administrator, Father Vijaya Mareedu, SAC. (NTC/Juan Guajardo) Check out photos from all four parishes. 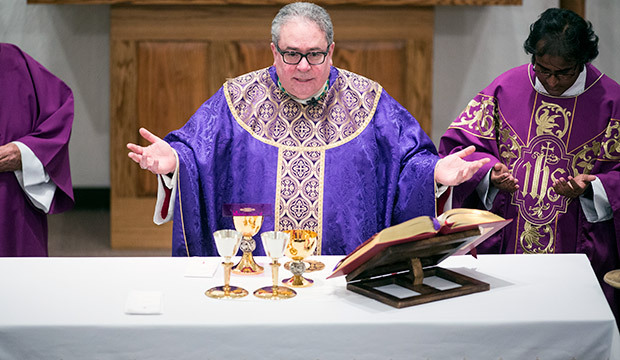 STRAWN — Bishop Michael Olson celebrated the Church’s New Year — the first Sunday in Advent — with a Saturday Vigil Mass at St. John Parish in Strawn. Sunday morning, parishioners at St. Rita Parish in Ranger, St. Francis Xavier Parish in Eastland, and Our Lady of the Holy Rosary Parish in Cisco appreciated that Mass was celebrated by the diocese’s shepherd and concelebrated by their parochial administrator, Father Vijaya Mareedu, SAC. Reflecting on the day’s readings, Bishop Olson encouraged the congregation to be attentive and not distracted by the calamities and disasters that happen around the world, the personal problems we have, and sin. Vigilance shouldn’t fill us with dread, but with hopeful expectation. “Be deliberate and ready, not for disaster, but for Jesus who gave His life for us, who gave us eternal life, to come and welcome us into His Kingdom,” he said. 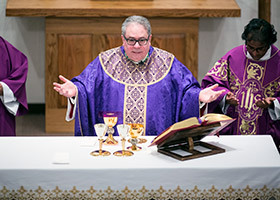 After his episcopal ordination on January 29, 2014, the prelate celebrated his first Mass as bishop of the Diocese of Fort Worth at St. John Parish. The congregation was pleased to welcome him back. At the Strawn parish, about twenty children in purple “St. John Angels” shirts were greeted individually by Bishop Olson before the vigil Mass. At its close, the children held luminarias and led the congregation in praying the Hail Mary. Highlights of the bishop’s visits to the three parishes on Sunday morning parishes included: a breakfast at St. Rita; planting a tree and blessing the youth group on the new property at St. Francis Xavier; and blessing the rosary making group at Our Lady of the Holy Rosary. Fr. Mareedu said that the bishop’s visit meant a lot to the congregations and reinforced the unity of the diocese. “It was a reminder that he is with us,” said the priest, who became parochial administrator of the four parishes on July 1. STRAWN — Bishop Michael Olson celebrated the Church’s New Year — the first Sunday in Advent — with a Saturday Vigil Mass at St. John Parish in Strawn and Sunday Masses at St. Rita Parish in Ranger, St. Francis Xavier Parish in Eastland, and Our Lady of the Holy Rosary Parish in Cisco.